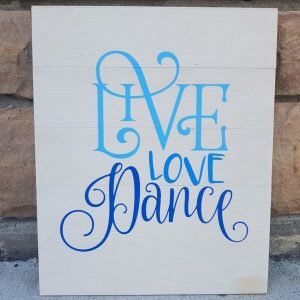 Creating a sign with just the right words in just the right colours to match just the right spot in your house, that’s what Board Art is all about. You can even take the finished sign home the same day! You choose design and base colours and we’ll walk you through every step, helping you get a great result. The key to Board Art is the custom stencil we create for your sign, helping you have fun and get a great result. We offer Board Art on a walk in basis every day. A wide selection of existing designs is available, you choose what you like and we’ll create a fresh stencil just for you. These signs are made to order, just for you. The words or names in the designs can be changed to make the sign perfect for a special occasion. Please call at least a few days ahead and let us know what you would like the sign to say. Prepayment is necessary. The paint needs to dry between layers, so give yourself at least two hours for the actual painting plus the time it takes to choose a design. Three hours is not unusual for designs with multiple colours, dark background, shading, all that good stuff. We have fans to speed up the drying, but give yourself enough time. Some of the designs are made to be personalized, such as monograms, family name designs etc. and we’ll be happy to make a custom stencil for you at no extra charge with two days notice. Pre-payment of the full amount is necessary to start the work. Simply choose the design you want from the Board Art Gallery and let us know what the text should say. The signs that can be customized at no extra charge will have a different colour for the editable parts. We’ll send you an email with an image of the finished design before you come. It is possible to alter many of the other designs but it is more involved. Alterations to designs that are not already made to be personalized has a charge that starts at $25. We’ll send you an image of the finished design, at which point we’ll ask for pre-payment of the full amount and the stencil will then be ready in two days. All rights to our altered designs will remain with us. Don't have time to paint the sign yourself? If you don’t have time to create it yourself but would like to give someone the gift of a handmade, custom sign, let us know. Give us a call or email with an idea for the design and we’ll get started on it for you. It’ll be the perfect wedding, baby shower, anniversary or corporate gift. Pricing will vary based on the design and time required, and starts at the price for the sign itself plus $25. Call us today to get a quote. Don't wear your finest clothes..
Board Art is made using permanent acrylic paints which means they will stain the clothes and shoes. We’ll provide aprons and gloves if you would like, but please keep this in mind and choose clothes and shoes accordingly.